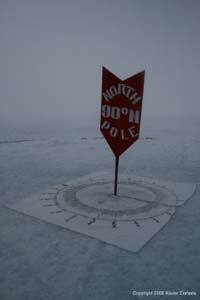 Xavier Cortada's installation at the North Pole. Miami artist Xavier Cortada has created art installations around the world to raise awareness about issues like global climate change, deforestation and the plight of endangered species. Now, in the year designated by the United Nations as "The International Year of Biodiversity," Cortada has a brand new project. Endangered World: Biscayne National Park will allow South Floridians from all walks of life to become part of an outdoor installation to be displayed at the park's Convoy Point Headquarters from Valentine's Day to May Day, 2010. For over a mile, 360 brightly colored flags will line the roads and trails at Convoy Point, each representing one degree of the planet's longitude. Individuals and organizations will adopt an endangered or threatened animal that lives at that longitude and paint an image of that animal on one of the flags. At the same time, participants will commit to an "eco-action" that directly or indirectly mitigates the plight of that animal. The eco-actions will be gathered and published in a blog online, and the flags will be on display for the 10 weeks leading up to BioBlitz, National Geographic's 24-hour species count of as many living things as possible in Biscayne National Park. On May 1, immediately following BioBlitz, flag creators will be invited to participate in the event's closing ceremonies. The flags will then become a part of an Endangered World traveling exhibit that will go to other national parks around the country. At the same time as the outdoor installation, Xavier Cortada will create drawings of the 17 threatened and endangered species that call Biscayne National Park home. These drawings will be on display in the park's Community Artists Gallery in the Dante Fascell Visitor Center from February 20 through May 2, 2010. Whether you are an artist, a teacher, a business owner, community organizer or a concerned citizen, Endangered World: Biscayne National Park has a spot for you. You can adopt an animal, commit to an eco-action and create a flag either on your own, or by participating in a workshop to be held in a variety of locations in South Florida. All the details are at XavierCortada.com. A "Meet the Artist” full moon reception, with refreshments will be held on Sunday evening, February 28th from 6-8 p.m. The exterior and indoor exhibit will be open daily from 9 a.m. to 5 p.m. from February 19th through May 1st, 2010. Both the exhibits and the reception are free and open to the public. The Dante Fascell Visitor Center is located at 9700 SW 328 Street, 9 miles east of Homestead, Florida. As the largest marine park in the National Park System, Biscayne National Park protects mangrove forests, clear bay waters, the northernmost Florida Keys and a portion of the world's third-largest coral reef.